HBCUs (Historically Black Colleges and Universities) are fighting to survive after graduating a long line of African-Americans graduates, some very famous ones among them including Dr. Martin Luther King, Jr. who graduated from Morehouse College. A federal District court judge ruled October 7 that the rights of students who attend four HBCUs in Maryland were violated after other, predominantly white state-funded institutions duplicated their programs. But that was a small win for struggling HBCUs: Four days before the government "shutdown," U.S. Secretary of Education Arne Duncan told the September 26 White House-sponsored National HBCU Week Conference that "this has been a difficult year for HBCUs." HBCUs are an integral part of African-American educational history, but they continue to struggle, and that has sparked concern about what HBCUs must do to remain relevant in the 21st century. Former chancellor of America's oldest liberal arts HBCU, North Carolina Central University, Charles Nelms wrote in June that too many people view HBCUs "as relics of the past incapable of producing graduates who are prepared to compete in graduate and professional school or in the world of work." 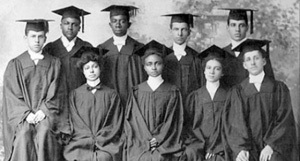 And Benjamin Todd Jealous, president and CEO of the NAACP, wrote in a September 20 editorial that the closing of Saint Paul's College in Lawrenceville, Va., after 125 years "serves as a canary in the coal mine for other historically black colleges and universities that face an uncertain economic future." For over 175 years, HBCUs have played a crucial role in African-American education, with many of the students the first in their family to attend college. And though they make up only 3 percent of the nation's Higher-Ed institutions, the 106 HBCUs graduate 50 percent of black public-school teachers, 80 percent of black judges, and award 40 percent of the 4-year degrees black students receive in the "STEM" fields of science, technology, engineering, and mathematics, according to the National Center for Education Statistics. But NCES data indicates that while the total number of African Americans enrolled at bachelor degree institutions increased 80 percent in 2011, in terms of "market share," HBCUs actually declined by 9 percent. One issue is years of inequitable funding. In 2011, the Department of Education tightened the standards for Parent PLUS federal loans - a program important for HBCU students. For the 2012-13 school year, the Parent PLUS loans dropped by 36 percent, according to a Washington Post analysis, causing HBCU's as a whole to lose $150 million in expected revenue. An August 16 Department of Education report cited 39,206 Parent PLUS Loan denials (68 percent of HBCU applicants) between March 2013 and August 2013. "I continue to remain concerned about students and families who were denied loans and may still qualify for reconsideration, but have not yet applied," Education Secretary Duncan said at the September 26 Conference. "It has been hard, it has been frustrating, and I know some of you are angry. However, some have said we are choosing not to reverse the policy because we don’t care, and nothing – nothing – could be further from the truth." One solution to the funding issue is that "HBCUs must enter into substantive, reciprocal academic and research partnerships with majority institutions, corporations and foundations, along with state and federal agencies," according to Nelms. "Institutions with substantial endowments and vibrant alumni giving programs are less likely to have problems with accreditation, student retention, leadership, and faculty satisfaction," notes the report, "The Changing Face of Historically Black Colleges and Universities," from the Center for Minority Serving Institutions at the University of Pennsylvania. Another problem cited is how efforts to diversify enrollments at traditional schools have negatively impacted HBCUs. In the October 7 ruling, U.S. District Judge Catherine Blake found that Maryland’s universities have continued to unnecessarily duplicate the programs of the state’s four HBCUs, violating the students constitutional rights and siphoning away students. Bowie State University, Coppin State University, Morgan State University and the University of Maryland Eastern Shore had filed the lawsuit in 2006. But the court also found that a lack of high demand academic programs has hurt recruitment at HBCUs. Judge Blake wrote that there should be an "expansion of mission and program uniqueness" at HBCUs and that "the transfer or merger of select high demand programs" from traditionally white institutions should be considered. The court also stopped short of ordering Maryland to formulate a new way for funding the universities. To counter this "diversity" threat from traditional universities, some HBCUs are now actively wooing Hispanics and other students. Mississippi’s Jackson State University and Louisiana’s Southern University at Baton Rouge are recruiting students from Brazil. In fact, a growing number of some 30 HBCUs have been exploring similar agreements with Latin America. While those HBCUs notetheir focus has been on international outreach, they are also preparing to expand their outreach to US Hispanics. 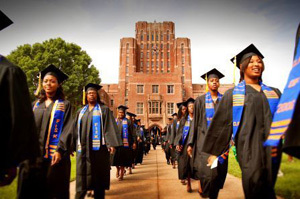 "The tremendous historic role of HBCUs must endure – but it must evolve as well. To cite just one example, HBCUs must play a leading role in ensuring that America reaches President Obama's goal of having the highest college attainment rate in the world by 2020," said Education Secretary Duncan. These Colleges and Universities need to be well running to preserve such a vital part of our nation's history. These HBCUs hold such value in their past and offer such a promise of the future. The public continually complains about the lack of African Americans in higher education so how could leaving these institutions out to dry better that concern in any way? The HBCUs have such value in educating African American students to become such important figures in society. If we want to solve our racial education problems we need to consider the source: institutions. HBCUs should be upheld and promoted to solve a social evil we struggle with as a nation. I understand that HBCUs are an important part of our nation's educational history. At the same time though, I'm stunned that I actually read the sentence "counter this diversity threat" in an article on this site. We acknowledge the fact that many of us come from homogeneous neighborhoods; America today is quite possibly even more segregated than ever. I know that my school and town were almost entirely homogeneous, and that going to college was the first time I really encountered people of another race, ethnicity, religion etc. To me, HBCUs take that diversity, an integral part to our education as students outside of the classroom, out of the equation, and that hurts us as a society and culture. Again, I realize that HBCUs had a tremendous impact on allowing African-Americans to get an education. But to me, I find it difficult to muster the sense of disappointment or shame that these colleges are (seemingly) on the way out.